It was people power versus "shock doctrine" on the streets of Paris on Sunday as thousands dared to defy the French government's ban on protests during the much-anticipated global climate summit. 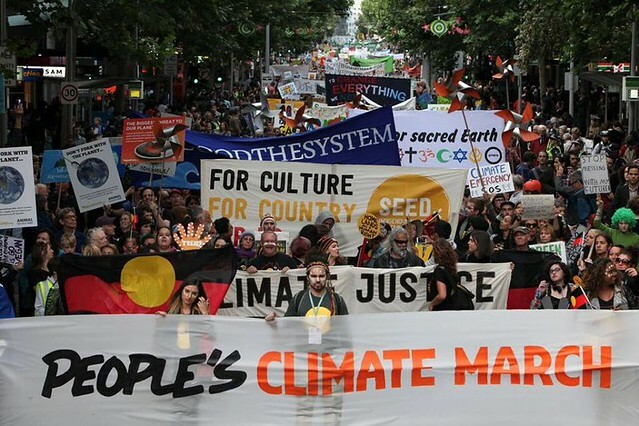 An estimated 10,000 demonstrators linked arms in a human chain along the 3 kilometer cancelled march route—joining the millions worldwide who took to the streets to demand that the assembled world leaders commit to bold action to confront the growing threat of climate change. Meanwhile, Paris police reportedly fired tear gas at a crowd of protesters at the nearby Place de la République and arrested over 200 people over the course of the day, in addition to the preemptive raids and house arrests placed on known climate activists in the days leading up to United Nations 21st Conference of the Parties (COP21). Reporting from Paris, activist Naomi Klein, who authored the book The Shock Doctrine, said that the French government crackdown on protest following last month's attacks represents a classic case of the "shock doctrine," which is when a government uses a "very real crisis to push through things they want to do anyway"—such as silence dissent or expand security and surveillance. Early Monday, Klein took to social media to directly call out French President François Hollande. And in a video dispatch produced by Mediapart and The Nation, Klein notes that while "security is a huge issue in France" right now, the "French government has really pushed that to eliminate protest during the COP." She says that those defying the ban are sending the "really important message" that "all security matters: State security, human security." "There can be no security in a world where there's 3 degree Celsius warming," Klein states, pointing to countries in the global south and low-lying Pacific island nations that, through rising oceans and punishing heatwaves and drought, are already confronting the very real dangers of climate change. Cindy Wiesner, with the Grassroots Global Justice Alliance, said in a statement that Sunday's demonstrators "stood in defiance ...to defend democracy, reclaim the streets, and stand in solidarity with people living alongside fracking wells, REDD projects, and nuclear facilities—all rejecting these false solutions that COP21 is intending to advance." And Pablo Solon, former Climate Chief Negotiator from Bolivia, added that "it is now more critical than ever to take to the streets to denounce the bad climate deal" currently being negotiated. "COP21 will be the worst of all COPs because it will see the planet burn," he said. "We cannot accept that." Environmental groups were quick to condemn the news that some of the protesters on Sunday were destructive and threw projectiles at police, but noted that the few bad actors should not drown out the global call to action. Climate action group 350.org issued a statement saying those individuals were "unaffiliated with the climate movement," and that they had violated the "nonviolent pledge that every group involved in the climate coalition" agreed to. Acknowledging those reports of violence, Klein added in a statement: "Even if one does not agree with every action that took place, this general atmosphere of defiance is something to celebrate. After all, government response to the climate crisis is wholly inadequate and puts us all in great danger. Obedience in the face of this failure would be tantamount to acquiescence." Further demonstrations and creative actions are planned to correspond with the two-week conference, including an International Tribunal on the Rights' of Nature later this week, a citizens' Climate Action Zone from December 7-11, as well as an alternate People's Climate Summit this weekend. See photographs from the global day of action below.